We get lots of functional, pretty all-in-one desktops through the PCWorld Labs, and the ET2701 INKI is Asus's latest entry. This high-definition, 27-inch system, priced at $1299 (as of 7/9/2012), is equipped with one of Intel's newest and fastest processors plus a discrete Nvidia graphics chip. The Core i7-3770S CPU runs at a 3.1GHz base clock frequency, with Intel Turbo Technology kicking it all the way up to 3.9GHz when needed. That’s plenty fast for any desktop, let alone an all-in-one machine. Asus coupled that with an abundant 8GB of DDR3-SDRAM, making applications open quickly. I love seeing all-in-one desktops with a discrete graphics chip, even if it's a midrange mobile one. The ET2701 INKI uses the Nvidia GeForce GT 640M GPU with a gigabyte of video memory on board. It ran through our Dirt 3 and Crysis 2 benchmarks on high settings at a maximum resolution of 1920 by 1080 pixels and scored an average of 41.3 frames per second in Dirt 3 and 19.1 fps in Crysis 2. While Dirt 3 is playable at that rate, the more-demanding Crysis 2 appears choppy and constantly skipped frames. The holy grail for gamers is the coveted 60 frames per second (or more), and the Asus ET2701 INKI manages to achieve that rate in both games by sacrificing resolution and graphics levels. The frame rate for Dirt 3 jumps to 77.5 fps when lowering the resolution to 1024 by 768 pixels. When we changed the settings to low and kept the resolution at 1920 by 1080, it managed 76.2 fps. For Crysis 2, we had to sacrifice everything, setting the graphics to low and the resolution to 1024 by 768 pixels to achieve 62.4 fps. While the Asus ET2701 INKI may not be designed with gamers in mind--hard-core gamers, at any rate--it still manages to get the job done. The Asus ET2701 INKI scored 111 on our strenuous WorldBench 7 benchmark suite. This means that it’s 11 percent faster than the baseline test-bed system. It’s impressive anytime a large, thin all-in-one can outperform our full-size desktop test bed. Fitting all those powerful components into a sleek, single package that fits in a chassis the size of an LCD screen is no easy feat. Though the screen is large and crisp with its 1920-by-1080-pixel resolution (making it suited, by definition, to 1080p video), it lacks any touch support, even though the release of Windows 8 is on the horizon. Given that Win 8's Metro interface emphasizes touchscreen features, it’s imperative that new systems take advantage of touch going forward. With touchscreen tablets so popular in the device market and Microsoft's own Surface tablet set to run Windows 8's Metro, desktops must have touchscreens to stay on a par with such competition. Also, a few gimmicky touchscreen games can really pique some consumers' interest. On the plus side, not being a touchscreen means less cleaning. The black border of the ET2701's screen is a fingerprint magnet and will get smudged as you tilt or move it. The menu and mode-select buttons are touch sensitive, so you don't even need to push them for activation. A slight graze will send your computer searching for HDMI input or will open the menu. The screen itself looks good from most angles (Asus claims 178 degrees of vertical and horizontal viewable angles), but it is very reflective when under direct light. The system comes with a single 7200-rpm, 2TB hard drive split into two partitions: a small one for the Windows 7 Home Premium operating system and a few programs, and a second partition labeled as a data drive. Such a split feels unnecessary, especially since everything is already on a single drive. Since programs naturally install to the C partition, which quickly fills up and causes low disc space warnings, I anticipate some confusion and frustration for casual PC users. The ET2701 is well connected all around. It has the typical gigabit ethernet adapter and wireless 802.11n connection. The addition of Bluetooth is nice for connecting applicable devices without having to use up the scarce USB ports. The system has a total of five USB ports: two USB 3.0 ports and an eSATA/USB 2.0 one on the side, plus two USB 2.0 ports on the back. This is far too few, especially since the dongle for the wireless mouse automatically takes up a slot. Other ports are an SD card reader, VGA (input only), an antenna, and an HDMI-in for hooking up a game console or media device. Including an antenna and an HDMI port is becoming common for many all-in-ones, as it supports the notion that they are not only PCs, but desktop televisions as well. It's great to kill two birds with one stone and get a completely functional television, but the lack of any kind of video output means no support for dual displays. On the other hand, Asus has included a Blu-ray optical drive, a great amenity on these high-definition, media-centric machines. An included wireless mouse and keyboard keeps the desk mess to a minimum. Finally, the all-in-one standard webcam and integrated microphone are included for online calls. Asus throws in its SonicMaster Subwoofer to provide better sound at higher volumes. It has its own special port on the side that is designed especially for the subwoofer, and a removable sticker protects it to make sure you know it’s proprietary. The subwoofer resembles a UFO and is large enough to be a prominent object on any desk. It indeed boosts volume, making even the halfway mark seem loud, and it helps the ET2701 INKI transcend other similar desktops when people are choosing a media-centric PC, because good sound is certainly considered part of the high-definition experience. The 'UFO' at lower left is Asus's SonicMaster Subwoofer. The HP Omni 27 101-T seems nearly identical to the Asus E2701 INKI in its components. They have the same screen size and same hard-drive capacity, and the graphics card and processor are near-equivalent. The Asus runs a bit stronger with its Core i7 instead of the Core i5 that the HP has; however, the Asus is over $200 cheaper (the HP is priced at $1549). The HP does have an extra USB port and a minimally better Worldbench 7 score at 115 (versus the Asus's above-mentioned 111), due to slightly faster hard-drive processing. But you would miss out on the Blu-ray drive, the extra powerful processor, and the slightly smoother gameplay of the Asus, not to mention a couple of Benjamin Franklins from your wallet. These advantages make the Asus is a home run in comparison. The Asus's configuration is also similar to that of the Dell XPS One 27, though the Asus is priced lower. The Dell fares a bit better on WorldBench 7, and it ships with 2GB of video memory. What really differentiates the two is the Dell’s higher resolution: 2560 by 1440 pixels, compared with the more-standard 1920 by 1080 pixels of the INKI. The Asus E2701 INKI is an excellent media machine, especially for such a low list price. You will no doubt get your money’s worth in terms of a computer, a good if less-intensive gaming machine, and a high-definition television. If you are a media maven to whom a touchscreen seems to be an unnecessary gimmick, this Asus may be a great fit. 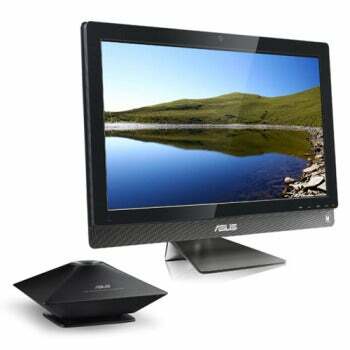 Asus delivers an affordable all-in-one, usable as a PC, light gaming system or HDTV.